San Francisco: Hummer didn't tone down the styling on its smallest vehicle, the H3. Owning up to its militarized look, it's still a rolling billboard that screams, "I want to melt the ice caps." But thank goodness to at least the interior in the H3, as it is by far, the best in any Hummer product. And at $30,000, it's also the cheapest. I wish Isaac Newton were still alive. Imagine the fun he could have with all our modern tools at his disposal. Instead of waiting around for an apple to fall on his noggin, he could use any university physics lab to discover how the universe works. And instead of postulating on boring stuff like calculus, he could help us understand the intricacies of the First Law of Hummer Dynamics: The smaller the Hummer, the better it is. 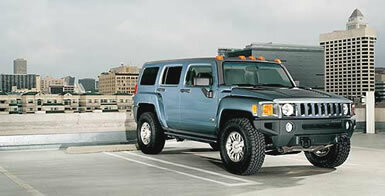 Hummer's first vehicle, dubbed the H1, was bigger than Justin Timberlake's ego, but it was absolutely awful. Slow, plodding, noisy and of all things, cramped. This G.I. Joe truck was the least practical vehicle the world had ever seen, and it cost more than $100,000 to boot. Today we have Hummer's third vehicle, and I'll let you guess the name, which is even smaller, and far better than the H2. This baby Hummer is light-years ahead of its siblings in terms of refinement and comfort. It still has serious off-road credentials, but it rides OK on pavement and can easily be maneuvered in parking lots. Best of all, it doesn't lose the original Hummer's screw-the-world styling. When you look at this vehicle, it seems to be saying, "I want to kill all the dolphins and owls and whales and polar bears and condors and penguins on the whole planet." It's looks wonderful! Thus, driving a Hummer, even a baby one, makes people angry. When you pull up at 7-11 to get a Coke, strangers give you the evil eye. Little old ladies look like they want to spit on you. It's like going to Disney Land while wearing a t-shirt that says, "I'm a convicted child molester." And that's why I love the $30,000 H3. It doesn't actually kill infant seals, but it looks like it should. It evokes a polarizing reaction from everyone who sees it, either people who love it because it's totally cool, or people who hate it because it symbolizes the melting ice caps. In a politically correct world filled with sterile, lifeless cars, designed by committees, and styled to avoid offending anyone, it's fantastic to drive a vehicle that makes people feel something, thrilling, and naughty and brash, all at the same time. You know it's very easy to forget riding in a Prius, but you'll always remember the first time you get to ride in any size Hummer. INFOBOX: What was tested? The 2007 Hummer H3 with a base price of $29,995. Options include: Automatic transmission ($1,695), sunroof ($950), XM radio ($325). Price as tested with a MSRP of $32,965. Why avoid it? If you're really bothered by people who give you dirty looks, then you can't drive this thing. It's too polarizing. Why buy it? Even though the Hummer brand has faced harsh criticism from environmentalists, the H3 stays true to its tough, off-road mission. It's also more efficient, meaning you can still look like you're killing the polar bears without actually doing it.